Soigneurs may very well have the most thankless job in professional cycling. They take care of the grunt-work details necessary to keep a pro team running smoothly while remaining mostly anonymous. Sara Clawson is a sports massage therapist in Greensboro, North Carolina who’s making inroads to a soigneur career. This spring, she spent two months working as a soigneur with the US elite junior team at USA Cycling’s training center in Sittard, Netherlands. Over the next month, Sara’s writing (originally posted on her blog) will shed some light on the “swanny life” as she recounts her experience traveling around Europe working with the next generation of American professional road cyclists. In the final installment, Sara works the brutal Three Days of Axel race in Zeeland, Netherlands and reflects on the fulfillment she’s finding as a professional soigneur. Prepping for any race is difficult, but trying to fit a literal truckload of supplies into the hatchback of a Volkswagen Passat was an absurd game of soigneur Tetris. We were headed to Zeeland, the coastal westernmost province of the Netherlands for the Junioren Driedaagse Axel: Three Days of Axel. Axel is the kind of race riders treat with equal parts love and hate. The road conditions are narrow and uncompromisingly rough, the wind is constant and punishing, and the huge field of riders makes the competition fierce and dangerous. We started five riders who would take on a 100 km road race the first day, a technical time trial the next morning followed by another 100 km road race in the afternoon, and another 100 km road race the following morning with 3 circuits featuring 6 major climbs. Axel is like hitting your toe with a hammer to quell a hurt thumb; it will make any other race seem mild in comparison. As soon as we arrived at the race lodging in Sas van Gent, I went to work finishing up bottle prep, making race food, and dishing up the enormous pot of pasta salad I had made the night before. Having a captive audience of perpetually starving young elite athletes is a really great way to boost one’s self-esteem as a cook — there isn’t much that they won’t inhale with considerable gusto, especially when it features a high percentage of carbohydrates. The first stage was a late start in the nearby town of Sluiskil. The mechanic and I drove together while the riders made the short 7 km trip to the start by bike. I had been studying the technical guide for days and had a rough idea of where the race route would progress, although it was by far the most incomprehensible race bible I have yet to encounter (in Dutch and Flemish, with some sections helpfully translated into French … which I don’t speak). I had a suitable feed zone picked out that would permit me to feed the riders twice, after the 50 km point and again when they looped back around 68 km — well within the UCI permissible range for feeding. I found my way with the Hot Tubes Development Team race support vehicle in tow. It was wonderful to have a feed zone buddy (and she gave me the best almond cookie I have ever tasted!). We fiddled with the race radio on my car and tuned in, which was really neat to get an idea of where they were on the course in real time and every move afoot in the peloton. 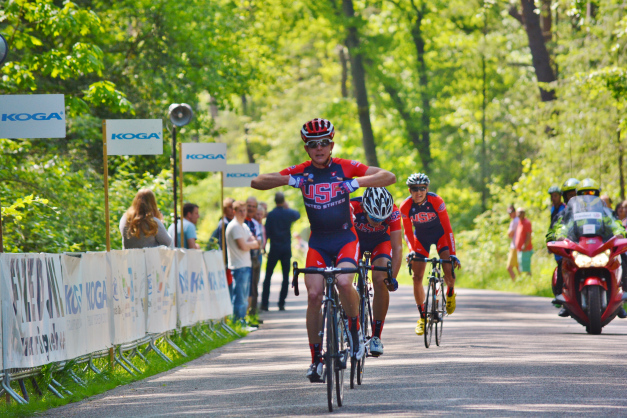 The USAC Juniors went 1-2-3 at the Koga Ronde Zuid-Oost Friesland. Photo by Sara Clawson. Soigneurs may very well have the most thankless job in professional cycling. They take care of the grunt-work details necessary to keep a pro team running smoothly while remaining mostly anonymous. Sara Clawson is a sports massage therapist in Greensboro, North Carolina who’s making inroads to a soigneur career. This spring, she spent two months working as a soigneur with the US elite junior team at USA Cycling’s training center in Sittard, Netherlands. Over the next month, Sara’s writing (originally posted on her blog) will shed some light on the “swanny life” as she recounts her experience traveling around Europe working with the next generation of American professional road cyclists. In part five, Sara and the boys take on a few days of racing in the Netherlands and land themselves a podium sweep. It’s a pleasantly steamy early summer evening in North Carolina and I’m enjoying a glass of wine on my porch and watching the fireflies dance in my yard. The relaxation and leisure of my life in this moment makes my life in Europe the last couple months seem like a dream. But I loved the thinly veiled chaos of my work in Europe as much or more than the luxurious Sunday afternoon nap earlier today. To bring you up to speed, we have to go all the way back to the Koga Ronde Zuid-Oost Friesland in the middle of May, a one-day interclub road race in the verdant farmland and pristinely groomed villages near Appelscha, Netherlands. We all had a few days to recover from the Peace Race. Legs were primed, injuries nearly healed. This was a new race on the calendar, and a dream-race for staff — spectacularly comfortable nearby accommodations (with an equally spectacular breakfast buffet), a non-UCI race with no caravan and no designated feed zones on the course, minimal gear, food, and prep necessary. Our seven-man team lined up with the directive of racing forward, getting at least one rider in every breakaway move, communicating with one another, and staying out of trouble. Easy enough. Once the riders were off, the director, mechanic, and I made our way back to the team car and proceeded to the first point in the race for open feeding, a picturesque tree-lined lane just after a section of pavé. These were not the helter-skelter cobblestones of Paris-Roubaix, but had enough of a crest in the middle to scrape against the undercarriage plate on the team car (which had been installed before Paris-Roubaix for that very reason). Coming off the first stretch of pavé, our smallest, lightest rider who was crushing cobbles for his first time ever streaked off the front of the peloton like a rocket. We knew already that we were in for a show. Soigneurs may very well have the most thankless job in professional cycling. They take care of the grunt-work details necessary to keep a pro team running smoothly while remaining mostly anonymous. Sara Clawson is a sports massage therapist in Greensboro, North Carolina who’s making inroads to a soigneur career. This spring, she spent two months working as a soigneur with the US elite junior team at USA Cycling’s training center in Sittard, Netherlands. Over the next month, Sara’s writing (originally posted on her blog) will shed some light on the “swanny life” as she recounts her experience traveling around Europe working with the next generation of American professional road cyclists. 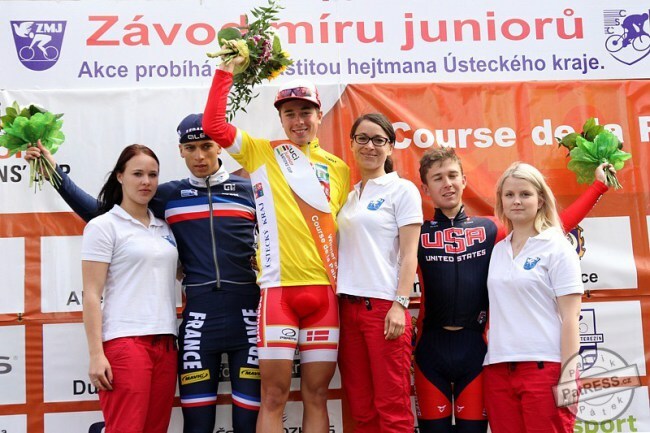 In part four, Sara takes us through the four stage Peace Race in the Czech Republic which saw American juniors racing to the podium and crashing hard enough to warrant a ride in a Soviet-era ambulance. We’re back home in Sittard after a whirlwind tour of Bohemia with another race on the books, this time the Course de la Paix, or Juniors Peace Race. Litoměřice, where we stayed, was a rather beautiful old town with a feeling of old-world European grandeur reemerging from the Soviet era drabness. The area has a rich history as one of the oldest Czech towns. It dates back to the 2nd century and served as a major trading capital of the region in medieval times. More recently, the whole region underwent German occupation during WWII and the nearby walled city of Terezín, where the race was headquartered, was used as a Nazi concentration camp, crematorium, and Gestapo prison. The Peace Race was originally established after WWII as a symbol of international goodwill and sportsmanship. We were housed in the hockey training center, which was a perfectly convenient and serviceable facility with dormitory-style living arrangements and an eating area for meal, bottle, and race food prep. The hockey facility housed our team as well as the British, French, and Russians. A total of 23 national teams competed from Europe, North America, and the Middle East. The Peace Race is part of the Juniors Nations’ Cup races, a series of events all around Europe, one in Kazakhstan, and one in Canada in which national teams of 17- and 18-year-olds compete among the highest-level junior road cyclists to earn Union Cycliste Internationale points for World Championships entries. Of the 11 races in this year’s Nations’ Cup, the Peace Race is considered by many to be the most challenging. This year’s edition certainly proved a challenge for everyone involved. We had mechanical issues with the team car halfway across Germany, and the mechanic and director ended up having to send me ahead with all 6 riders while they got the car towed for repairs. The one rider on the team who had been to the race the previous year alerted me to the getting an entry permit sticker for the van and helped guide me through the tortuous single-lane mountain road to Litoměřice. The director and mechanic arrived shortly thereafter and we headed to dinner in the beautiful and expansive cobbled city square. Soigneurs may very well have the most thankless job in professional cycling. They take care of the grunt-work details necessary to keep a pro team running smoothly while remaining mostly anonymous. Sara Clawson is a sports massage therapist in Greensboro, North Carolina who’s making inroads to a soigneur career. This spring, she spent two months working as a soigneur with the US elite junior team at USA Cycling’s training center in Sittard, Netherlands. Over the next month, Sara’s writing (originally posted on her blog) will shed some light on the “swanny life” as she recounts her experience traveling around Europe working with the next generation of American professional road cyclists. 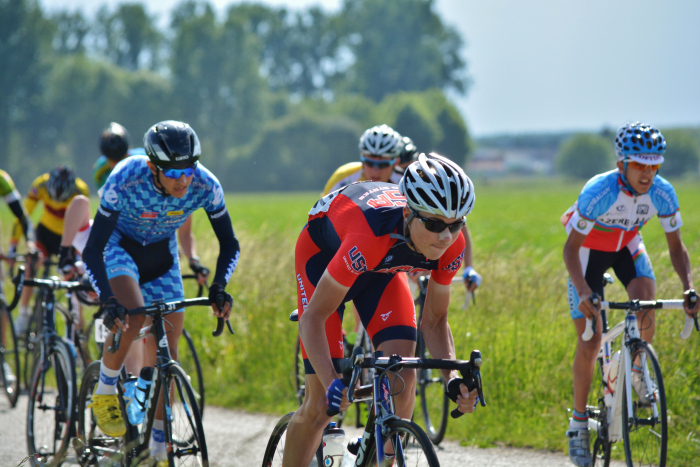 In part three, Sara explains the nitty-gritty of a race weekend in France as the juniors and U23s do their best to perform at pro-tour level. Working a major race as elite cycling team staff is not for the faint of heart, and I am coming to understand why the turnover in the industry is comparatively low: people who aren’t up to the rigors of the work for whatever reason burn out quickly, and the few who make the cut tend to become career team staff. I’m not sure who works harder: mechanics or soigneurs — both jobs require long hours of exhausting work. The Tour de Bretagne was a UCI 2.2 stage race, which means a limited number of national teams were invited (in this case, two: the USA team, and the Australian national team) along with European continental teams, pro development teams, and pro tour teams. It’s a very high-level race in which stage winners and riders high in the overall finish ranks have historically continued on to successful professional careers. The race consisted of seven stages between 145 and 200 kilometers over challenging terrain in the rural northern coastal country of France. The six USA national team riders selected for the race were charged with two major tasks: return some good results and, perhaps more importantly, to learn the skills needed to race at the level professional teams look for in prospective riders. To paraphrase their director, former pro rider Michael Sayers, racing at events like these presents a goal that isn’t necessarily meant to be attained, but for learning to occur in the process of striving toward that goal. Bringing away a couple good results and a wealth of experience constitutes success, and in that respect the Under-23 riders of the USA national team were very successful. 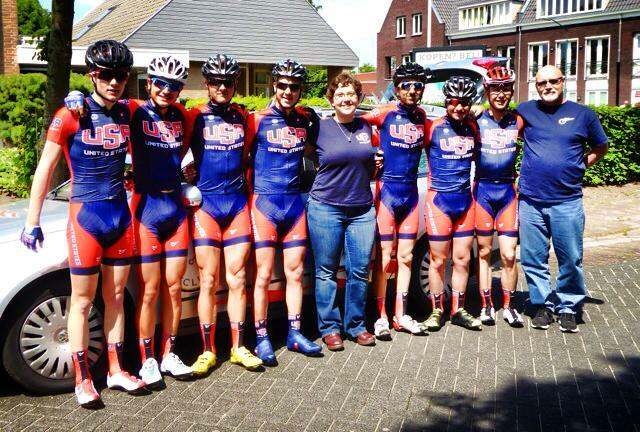 Soigneur Sara Clawson (center) with the USA Cycling juniors in Sittard, Netherlands. Soigneurs may very well have the most thankless job in professional cycling. They take care of the grunt-work details necessary to keep a pro team running smoothly while remaining mostly anonymous. Sara Clawson is a sports massage therapist in Greensboro, North Carolina who’s making inroads to a soigneur career. This spring, she spent two months working as a soigneur with the US elite junior team at USA Cycling’s training center in Sittard, Netherlands. Over the next month, Sara’s writing (originally posted on her blog) will shed some light on the “swanny life” as she recounts her experience traveling around Europe working with the next generation of American professional road cyclists. 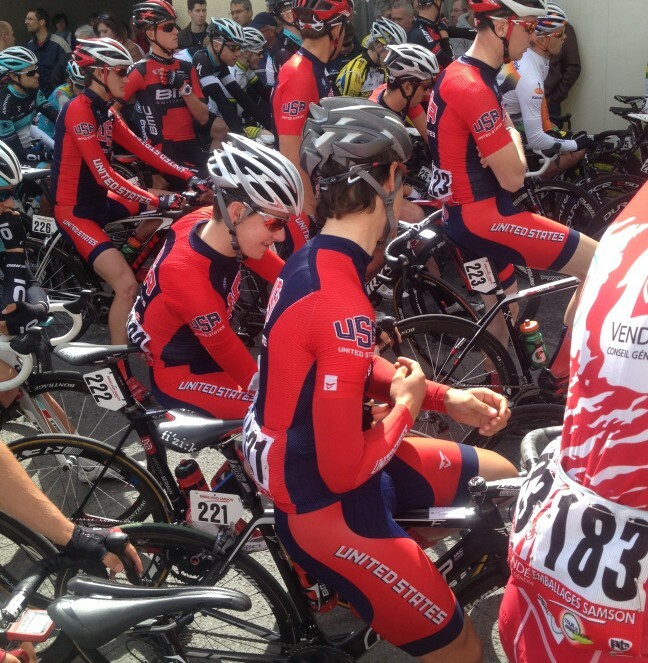 In part one, Sara talks about her path from aspiring soigneur to the USAC house in Holland. The French word “soigneur” literally translates to “one who cares for the troubles of others.” On a bicycle racing team, a soigneur performs a multifaceted job of keeping the cyclists’ bodies and minds optimally primed for competition, doing everything from sports massage and minor first aid to food and bottle prep to tasks like laundry and chauffeuring riders. When I was first getting into cycling as a teenager, I read a USA Today article about soigneurs that described it as one of the “10 Worst Jobs in Sports.” The article is a fun read (and to my experience thus far, quite accurate), making the soigneur’s job sound like a lot of hard, thankless work. It sounded exactly like the kind of job I wanted to make my career.